We are living through a war between Western Civilization and the radical Islamic Jihadists who have now attacked us in London, Brussels, Paris, Nice, Berlin, Stockholm, St. Petersburg and Egypt (as well as Orlando and San Bernardino in the USA). As one commentator said, “Even if we defeat ISIS in Mosul and Raqqa and wipe out their geographical territory, they have now gone “virtual” and on-line, and tell their followers around Europe that all they need to execute an attack, is a car, and a kitchen knife.” We have, therefore, the horrible prospect of a continuing series of low-level attacks in major population centers of Western Europe. Whilst we are confident that eventually European and Christian civilization will overcome this threat, as it has historically overcome Nazism and Communism (and, indeed, anarchists around 1900 who were also crazed fanatics with bombs), it is a deterrent to tourism, and to some extent investment, in the Western countries. Now let us look at Asia. Among the major countries in which we invest are India, which has just under 200 million Muslims; Indonesia, with nearly 252 million; Pakistan, 185 million; and Bangladesh, 158 million. Broadly speaking, all these countries have been peacefully developing economic prosperity over the past several years and decades. There are, of course, Islamic extremists, but they have not disrupted life in a major way. China, too, has a large Muslim minority of 1.8% or between 25-50 million, mainly in Xinjiang, which is predominantly the Uighur minority. The Chinese government has been extremely tough on cracking down on extremists in this area. In Singapore, after 9/11, Lee Kuan Yew imposed a draconian control of the mosques so that no radical preachers were allowed, and every member of the congregation was monitored. They have had no problems since then despite the Malays being 20% of their population. India, most impressively, has managed to co-opt and control their Muslim minority, despite Mr. Modi being, himself, a devout Hindu and leader of the BJP, which has an avowedly Hindu message. There has been far less intercommunal tension in the past few years than there was under British rule 70 years ago. The point is that the Asian governments have taken an extremely tough line on extremism and are not prepared, as some European countries are, to “tolerate the intolerant”. Although Indonesia and Malaysia have become more conservative (for example, wearing veils) in their practice of Muslim religion and culture than they were a generation ago, the recent elections in Jakarta, for example, indicate that the extremists do not have much popular support. Meanwhile, the business mood of the Asian countries in the first quarter of 2017 has been fairly robust. 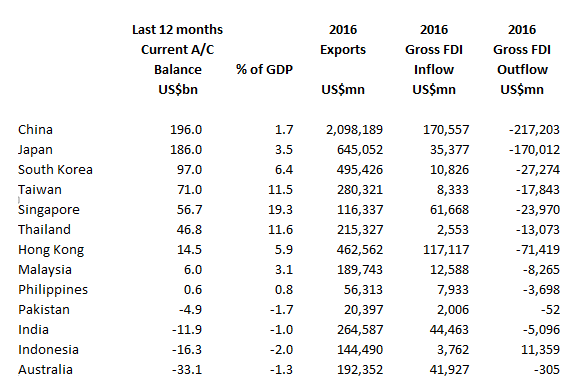 The accompanying table indicates how strong the current account surplus is in China, Japan, and all the other major trading countries. Even India has now boosted its exports to the highest level in several years, growing 17% in February and has also achieved a new record of foreign direct investment of over US$40bn annually. Contrary to the rather bleak view of world trade which we had a year ago, the situation has reversed itself and Baltic freight rates are now climbing; exports are growing; and the deflationary trend in Japan and in China (where producer price inflation had been negative for almost 5 years) has now been reversed, and we are seeing inflation in raw materials prices and wages for the first time in several years. This is obviously good news for commodity producers in Australia, Brazil, Southeast Asia, and elsewhere and encourages further capital investment. For investors today, the USA, which is 54% of the world stock market, has a magnetic attraction; but if we look beyond the short-term, surely it is clear that the tremendous positive changes occurring, in countries such as India and China, will produce outsized investment returns over the longer term. The technological changes which we see in America, such as electric cars, solar power, medical breakthroughs, and financial technology are quickly followed and mirrored in the Asian hemisphere. India has, possibly one of the most modern banking system in the world with its new digital on-line transactions and instant personal identity by fingerprint. What is perhaps less well appreciated by Western investors is that many of these financial groups in the Indian Ocean region are selling on less than 10 times earnings. We have, for example, invested in a bank in Sri Lanka which sells at 0.9 times book on a P/E of 4.8 times, a dividend yield of 7%, with earnings growth of 40%. Small and illiquid as many of these counters are, we believe that the chance to make long-term investments in under-researched, and neglected markets are our forte where we can produce outstanding alpha. Returning to the geopolitical situation, we have growing tensions between Russia and the USA after the Syrian missile strike; the North Korean crisis continues; and gold has reached $1,275 an ounce. We have to expect some setbacks in world stock markets over the summer, as valuations are becoming stretched, volatility is very low, and expectations of Trump’s tax cuts and world growth may be too optimistic. China’s decision to support, or even strengthen, the Yuan against the dollar, has many consequences. Domestic interest rates are rising in China, in tandem with the Federal Reserve policy tightening, and this will put pressure on Chinese borrowers, as well as smaller banks; NPLs will rise. In addition, the clamp down on Chinese citizens and companies taking money out of China since December has also had unintended consequences. The unexpected 25% jump in real estate prices in Shanghai and Shenzhen, for example. President Xi Jin Ping’s directive to the PBOC and other authorities was, above all, to “maintain stability” in 2017 before he is re-elected for a second 5-year term in October. The question is whether some external event, or internal pressures, may intervene to destabilize this happy prospect in the next 6 months.